Help! I am in desperate need of some new, fun recipes to try. I like to cook things that are healthy (for the most part) and don’t take too long. What are your favorite quick and easy weeknight recipes? 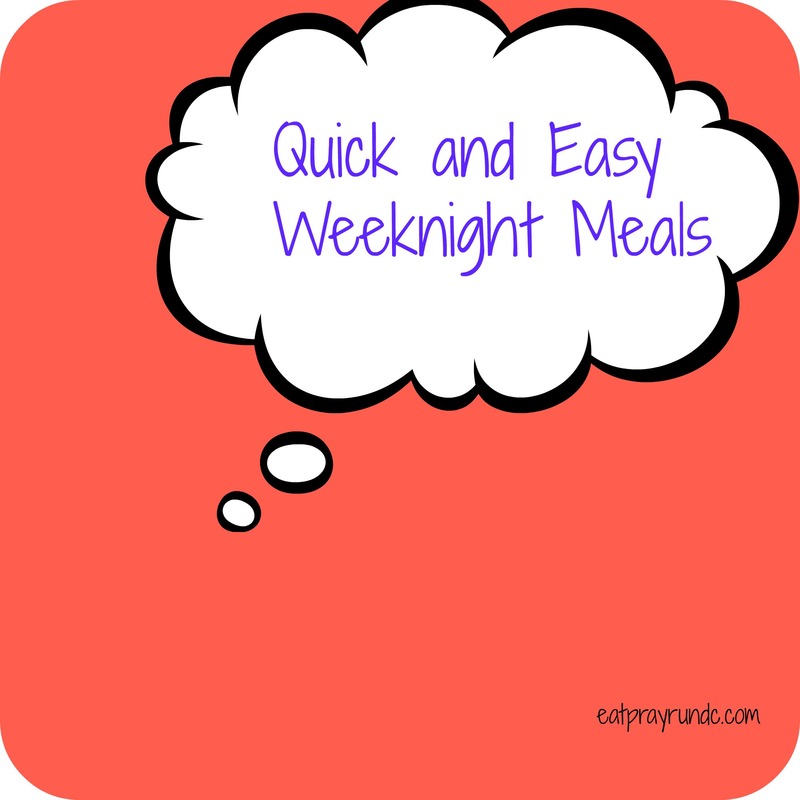 Share your favorite quick and easy weeknight recipes and be sure to swing back throughout the day to check out everyone else’s recipes! Speaking of mini pizzas, I like doing the mini pizza rolls by using Cresent rolls. Just add cheese, sauce, and pepperoni. I bought all the ingredients a while ago but still haven’t made them yet! Yum! I will definitely have to try that! Earlier this week we made these copycat Chipotle bowls (without the chicken) and they were really good. They tasted very similar to what you would get at Chipotle and it didn’t take a lot of time at all. Thanks for sharing – just pinned this! I get trader joe’s pizza dough, divide it up according to the nutritional info on the back, and on Sundays I’ll make some kind of topping. Last time it was mushrooms with black garlic, rosemary, white wine and a bunch of other stuff I had sitting in my cabinet. Meal for the week done. Trader Joes is THE BEST! Great idea! One of mine is actually featured on my blog today, Chicken Taco Soup. It’s a slow cooker one, and literally just a “dump” soup. Love it! Going to go check that out! Thanks Betsy! Spaghetti Squash! Nuke it in the microwave for five minutes (cut in half lengthwise first and scoop out insides), use a fork to pull the squash out like spaghetti, in the mean time heat up sauce and add. Seems easy enough. I did a recipe I found and posted it on Monday, super tasty! Rosi recently posted…DAY 45 P90X3, HALF WAY! ooooh, risotto is something the top chef contestants always mess up – i’ve never made it but want to give it a shot! Thanks for sharing your meals – everyone! Okay, for us, I open a few cans of tuna or salmon. Next mix in some mayo, a little mustard, and salt and pepper to taste. Throw all of that over a bed of romaine and spinach with a few chopped tomatoes. Top with ranch dressing, and serve. We also eat that with a few rice crackers. 30 minute fried rice – SOLD! Featured you on FB 🙂 Thank you for joining the linky!